You’ve probably heard the words “silver-gold ratio” if you’ve done any reading about investing in silver and gold. When you compare gold prices to silver prices, you see a big difference, with silver currently trading around $16 / oz. compared to gold at around $1,300 / oz. How could you look at those numbers and tell whether silver is overpriced or underpriced? Simple: the silver-gold ratio. The historical silver-gold ratio was the same throughout most of human history, around 16 to 1. That started to change around the 1880s. The historical average for the last 300 years is 27, while in the last 30 years it’s fluctuated between 30 and over 90. Silver and gold generally share price trajectories, with silver often following gold. 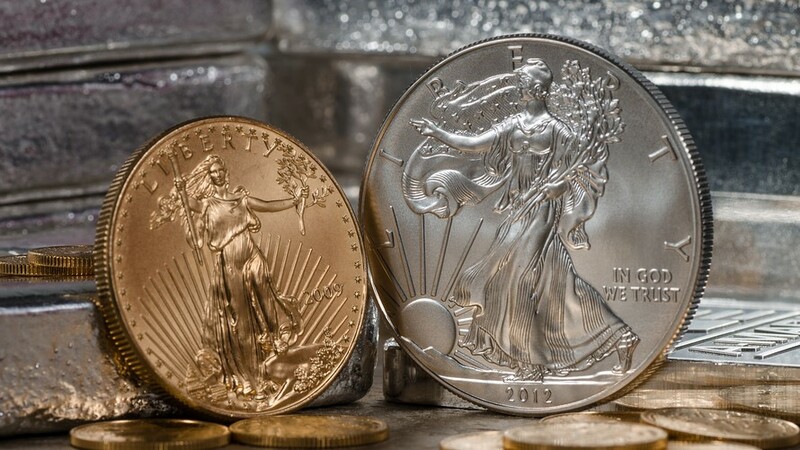 Comparing the two precious metals helps investors understand which one is a better deal. Silver is more volatile, so when gold prices go up, silver prices rise even faster, and the silver-gold ratio shrinks. When gold prices start to fall, silver also falls faster, and the ratio increases. Right now, the market is seeing the results of a fall after peak precious metal prices in 2011. Silver is undervalued, and it could gain a lot of ground the next time market forces send gold and silver prices back up. But how far could silver prices go? Using the prices above (and prices change constantly), the silver-gold ratio would be around 81. That means that either silver is highly undervalued historically or gold is overvalued. However, given the fact that gold has spent several years in this price range, many believe that it’s experiencing a bear market, neglected in favor of a stock market that until recently seemed like it could only go up. You can use the silver-gold ratio to see what kind of growth potential silver might have. While it’s always a risky business trying to forecast silver prices, the silver-gold ratio gives you an idea of what’s possible given historical trends. As mentioned above, the latest price of silver has roughly an 81:1 ratio with gold. If gold held steady at $1,300 / oz., a move toward a ratio of 60 would have silver at $22.60. A more dramatic shift to the historical average of 27 would have silver at $48 / oz. Investors have a lot to gain from investing in silver. It has a higher growth potential than gold. You can start investing in silver quickly and easily by buying silver coins from dealers like Silver Gold Bull. The bigger your investments, the more storage will become an issue. But with dealers like Silver Gold Bull, allocated storage solutions mean you can invest in any volume of silver. It’s estimated that silver is about 17 times more abundant than gold on the planet Earth. Industrial demand and the use of silver in applications that are not recyclable could one day diminish the total available silver. For now, mines continue to produce silver, though supplies are becoming tighter. Most experts agree that gold will always be more valuable than silver, but that doesn’t mean that investors can make more money from gold. Silver is presently undervalued and any move closer to historical averages would be a huge boon to investors who chose silver over gold.